Ioannes Brown (9 Maii 1800–2 Decembris 1859) fuit abolitionista Civitatum Foederatarum et popularis vir fortis, qui seditionem armatam vehementer suasit et fecit ut modus ad omnem servitutem finiendam. Internecionem enim Pottawatomiae anno 1856 in Kansia Cruda duxit, et famae consuluit in improspero incursu ad armamentarium apud Harpers Ferry anno 1859. Praeses Abraham Lincoln dixit eum esse "fanaticum in errorem inductum" (Anglice: a misguided fanatic), et Brown appellatus est "controversissimus omnium saeculi undevicensimi Americanorum" (Blue 2006:481-482). Eius conatus in Harpers Ferry ad motum liberationis servorum Americanorum Africanorum incipiendum rempublicam tremefecit. Accusatus perduellione contra Virginiam civitatem, occisione quinque Meriodionalium qui servitutem fulserant, et instigatione seditionis servorum, Brown iudicatus, capitis condemnatus, et suspensus est. Meridionales dictitaverunt eius seditionem fuisse solum minima rationis abolitionistarum pars, et vera Factionis Republicanae desideria monstravisse. Hodierni consentiunt historici incursum ad armamentarium apud Harpers Ferry anima excitavisse—quo facto, proximo anno ad secessionem, seditionem, et Bellum Civile Americanum duxit. Ruchames, Louis, ed. 1959. A John Brown Reader: The Story of John Brown in His Own Words, in the Words of Those who Knew Him. Franklin Sanborn, ed. 1891. 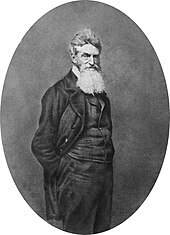 The Life and Letters of John Brown. DeCaro, Louis A. Jr. 2007. John Brown—The Cost of Freedom: Selections from His Life & Letters. Novi Eboraci: International Publishers. Johnson, Andrew. 1859. What John Brown Did in Kansas: oratio in Camera Repraesentativorum Civitum Foederatarum, 12 Decembris 1859. Primum editum in The Congressional Globe, The Official Proceedings of Congress, "Published by John C. Rives, Washington, D. C. Thirty-Sixth Congress, 1st Session, New Series . . . No. 7, Tuesday, December 13, 1859," pp. 105-106. Inventum 16 Maii 2005. Blue, Frederick J. 2006. [Commentarius ignotus in] American Historical Review 111. Chowder, Ken. 2000. "The Father of American Terrorism." American Heritage 51(1):81ff; versio interretialis (pdf) apud files.blog-city.com. DeCaro, Louis A., Jr. 2002. "Fire from the Midst of You": A Religious Life of John Brown. Du Bois, W. E. B. 1909. John Brown. ISBN 0-679-78353-9. Finkelman, Paul, ed. 1995. His Soul Goes Marching On: Responses to John Brown and the Harpers Ferry Raid. Goodrich, Thomas. 1998. War to the Knife: Bleeding Kansas, 1854-1861. Malin, James. 1942. John Brown & the Legend of Fifty-Six. ISBN 0-8383-1021-4. Nevins, Allan. 1947. Ordeal of the Union. 2 vol. Nichols, Roy F. 1956. "The Kansas-Nebraska Act: A Century of Historiography." Mississippi Valley Historical Review 43:187-212. Nudelman, Franny. 2004. John Brown's Body: Slavery, Violence, and the Culture of War. Oates, Stephen B. 1970. To Purge This Land With Blood: A Biography of John Brown. Oates, Stephen B. 1979. Our Fiery Trial: Abraham Lincoln, John Brown, and the Civil War Era. Peterson, Merrill D. 2002. John Brown: The Legend Revisited. ISBN 0-8139-2132-5. Potter, David M. 1976. The Impending Crisis, 1848-1861. Renehan, Edward J. 1995. The Secret Six: The True Tale of the Men Who Conspired with John Brown. Reynolds, David S. 2005. John Brown, Abolitionist: The Man Who Killed Slavery, Sparked the Civil War, and Seeded Civil Rights. Rodriguez, Junius P., ed. 2006. Encyclopedia of Slave Resistance and Rebellion. Westport Conecticutae: Greenwood. Scott, Otto, 1979. The Secret Six: John Brown and The Abolitionist Movement. SenGupta, Gunja. 2001-2002. "Bleeding Kansas: A Review Essay." Kansas History 24:318-341. Bisson, Terry. 1988. Fire on the Mountain. Brooks, Geraldine. 2006. March: A Love Story in a Time of War. Cliff, Michelle. 1993. Free Enterprise. Ehrlich, Leonard. 1932. God's Angry Man. Flint, Eric. 2006. "1824: The Arkansas War." Fraser, George Macdonald. 1994. "Flashman and the Angel of the Lord." "John Brown's Body" (primum appellatum "John Brown's Song"). Carmen per Bellum Civile Americanum Unioni gratissimum. Olds, Bruce. 1995. Raising Holy Hell. Rinaldi, Ann. 1997. Mine Eyes Have Seen. Santa Fe Trail (film). 1940. Summers, Kevin G. 2008. "His Soul Goes Marching On." In Tales of Moreauvia, issue one. Novissima mutatio die 9 Maii 2016 hora 06:36 facta.